Whenever Robert Zemeckis makes a film, it will almost always have the name of Alan Silvestri against the music. Director and Composer have the same kind of partnership as Hitchcock and Herrmann, or Spielberg and Williams. They started out with the "Back to the Future" trilogy and "Romancing the Stone" and moved on to do "Forrest Gump" and "Who Framed Roger Rabbit?". Their most recent films together being "Cast Away" and "Polar Express". Though frequently associated with lighter material, Alan Silvestri has scored for darker more gothic films before such as "The Mummy Returns" and "Van Helsing" (though neither were with Zemeckis) so he is certainly no stranger to material in this part of the spectrum. For those who don't know the background, Beowulf is the hero of an ancient epic poem and Zemeckis chose to render his film version using the Performance Capture technology that he had previously used on "The Polar Express" which essentially converts real actors and scenes into computer animated format. This gives the film a unique visual identity and challenging composer Silvestri to match this musically. The "Beowulf Main Title" is very short at less than a minute, but this brief exposition establishes some of the key elements: some modern electronic sounds, vocal chanting, rhythmic drumming and the main theme itself which features in extended form in "What We Need is a Hero" and referenced throughout the film's soundtrack. While the electronic elements seem to fit with the digital imagery and adds a mythical otherworldly dimension, the score is largely grounded in a traditional orchestral palette which helps the drama and characterisation. In complete contrast "Gently As She Goes" is a simple song in medieval form, sung by Robin Wright-Penn who plays the character "Wealthow" in the movie, and whose innocent-sounding vocals return in the gentle ballad "A Hero Comes Home". The enemy is portrayed in the two "Grendel Attack" tracks, the first being largely suspenseful in nature, while the second fully bringing out the nature of the threat in some extreme musical characterisation. Coming immediately after "The Second Grendel Attack", the start of "I Am Beowulf" seems to depict the human impact of the attack and establish Beowulf's heroic motivations. While seemingly absent from the US version of the soundtrack CD, "The Seduction" has an appropriately haunting quality. "He Has a Story to Tell" is an interesting track for Silvestri fans in the way its conventional thematic material played on the horns remind the listener of earlier scores from this composer. 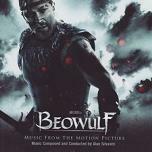 And this style of brass-led action heroics fully pays off in the soundtrack's climax with "Beowulf Slays the Beast". The CD finishes off with the much calmer "He Was The Best Of Us", the mysterious "The Final Seduction" and the final song is a dramatic version of the earlier folk-song this time sung by Inina Menzel with full orchestral accompaniment. While reservations have been expressed about the effectiveness of the movie itself, it is interesting to hear Silvestri turn his hand at this style of soundtrack. While very much in the modern action heroic mode, he avoids the temptation to be too over the top, and the balancing songs and lighter material helps to sustain interest throughout the soundtrack. If you rip the CD to play on your PC or create mp3 files for your player, it's a nice touch that they retain full track names rather than names such as "track 8" which are less than helpful. This recommended CD can be found at Amazon.co.uk and Amazon.com.